Accept nothing less than the best. If you're looking to invest in a large tent that'll stand the test of time, then seriously consider the 60' x 80' Mystique High Peak Tension Tent from Ohenry Tents. 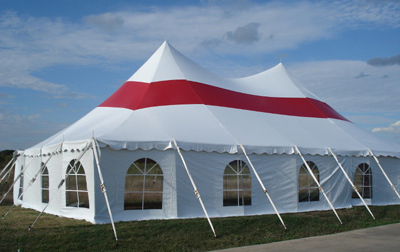 Whether it's for event hosting, temporary storage, outdoor revivals, or even the tent rental businesses - this amazing canopy can handle it all. Designed to thrive in all sorts of weather, this tent includes a heavy-duty 15 oz. "Block Out" top, galvanized steel poles, 2" Seatbelt reinforcing, twin center poles, and triple reinforced stress points.